When I find a few minutes to sit and sketch, I can never resist these furry little fellows. They are just too cute! I have never understood why people are so afraid of mice - or in this case, RATS! On the subject of furry friends, I've been missing Codi in a big way. Lately though, the chickens are really making their presence known! Just yesterday as I was making their porridge, whilst Marjorie and Babs ventured into the back porch, Frankie not only wandered into the kitchen as she often does, but this time she flew up on to the kitchen Island and perched herself there, staring intently as I stirred! Clearly she was getting rather impatient for her supper! I don't mind her wandering into the kitchen. She will usually just peck up any crumbs she comes across on the floor, which I may have missed with the broom. I think the most amusing sight was when she pressed her face against the oven door as though she was trying to see what was inside. Aren't chickens usually looking out of the oven window, rather than in it, lol? If only Frankie knew that, she might not be so keen to go so near! It has to be said, our feathered girls are quite safe from the dinner table - I don't think I could ever eat something that had a name! It's still cold and dark here in the UK at the moment and whilst I don't want to wish that time would pass by any more quickly than it seems to already, I am looking forward to warmer and longer days. In the Spring I hope to be sketching the girls as they roam the garden instead of curling up indoors with the sketchbook in my lap. Q: What is the best thing that has happened to me during the last week? Hey Sandra GREAT NEWS!!! that is an excellent breakthrough. I really hope you sell some work and extend the contract. Wow Sandra ... a 6-month contract!!! How fantastic is that!! I am so pleased for you. It's very well deserved - Congratulations!!! Oh Sandra, what exciting news! Congratulations! I love Lord Archibald the II! Sandra, that is the greatest news about the gallery!!!! Good for you! I am smiling too as I write this. Your rodents are absolutely adorable -so much personality and character! And your chickens sound like something else!! I have never heard of them making themselves at home in one's kitchen!!! LOL!! I will send you some chinchilla photos, and if you want to do a different rodent, you are most welcome to do so. And I dearly love your rat sketch, and always look forward to more of them. I don't understand why people are afraid of them either. I remember one time when me and my husband were first married and he was at home one afternoon studying for university while I was at work. He called me and was very. . . distraught, because he had spied a mouse scampering across the floor of our tiny little apartment. I still chuckle about that. Such a strong man and such a little mouse. What did he think I was going to do about it anyway?? And I'm smiling from ear to ear for you too. *hugs* for you and missing Codi still. the mouse, as always, is very gracious and very well designed. Congratulations with the gallery - well deserved. You're going to be busy - hope it all goes well and you sell lots! Love the rat - you've done it beautifully. Wow Sandra, what fantastic news, congratulations for this deserve opportunuty. I'm happy for you and I wish you a big success! Your mouse is really pretty. Hugs! Amazing news Sandra. I am so pleased for you! That's great news! Many congrats on the gallery contract!! Yay!! Congratulations Sandra! And I have to say, that mouse is exquisite. WOW!!! CONGRATULATIONS!!! how wonderful! so deserved!! and lord archie is exquisite! I am so delighted for you! that's fantastic and no one deserves it more! so, how does that work, do they take a set amount of paintings and show them for 6 mths or do you add more during that timaas you finish them? it's my aim this year to find a gallery (and get enough work to show) so i hope you won't mind me picking you brains! I love that you have chickens-i would love some rescue battery hens if we only had room for them. i only wish folk would imagine that every creature stuck in a farm waiting for the slaughterhouse could have had a name and then maybe none of them would get eaten! sorry, just dreaming of a vegan utopia! i imagine your chickens are aware you're missing codi and are coming to spend time with you -very intelligent wee birds, i believe. and i love wee Lord Archibold. 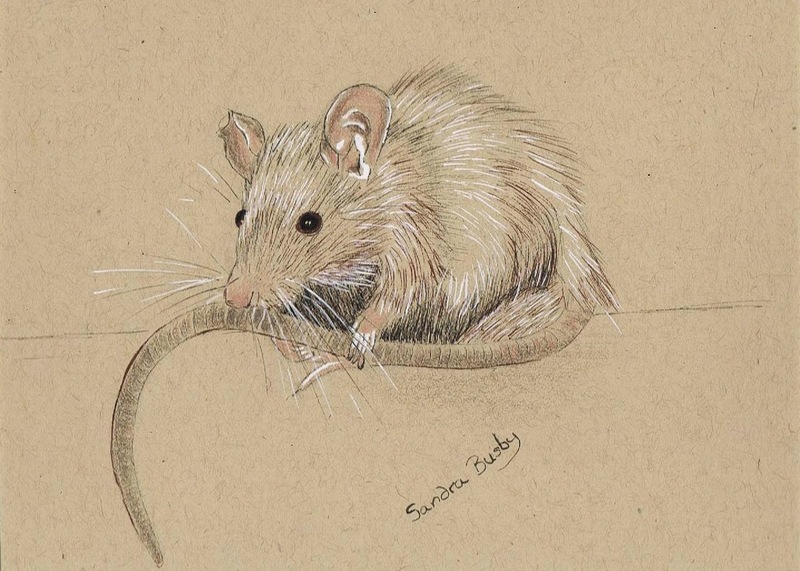 i would also love to add a rat to our family but i think the dogs would think he was a toy so perhaps not! But this is GREAT news, Sandra! Wow! I rejoice with you, I am really, really very happy for you, because you deserve it! I am toasting to your success! BRILLIANT NEWS ! Congratulations Sandra so very very happy for you . What a tender mouse! It seems real, good day, Arianna! Love your post, Sandra! As always, it makes me smile. Congratulations of your contract with a gallery! You deserve it!!! and of course, love this little mouse! Sandra, I tried to comment on your post a few days ago.. I don't know why I could not... I just read you comment to me about the Rainbow Bridge and yes, I've always been aware of that.. and what it means.. but I'd forgotten about it until you brought it up. We will heal, we have those memories inside our hearts and thats what we're left with... Thank you so much for your kind words..